Ed. Note: The below story ran in print on December 29, 2018. It was originally held back online as the Herald waited for additional comment from CSC. The story has been updated with two responses from CSC, included following the piece. This is the third part of a three-part series. Part one can be found here and part two here. Kyle Reynolds is fed up. A 29-year veteran of Correctional Service Canada (CSC), Reynolds has been a vocal advocate for better mental health support for officers and staff for years. He’s since retired, but after his experience and speaking to dozens more who have lived through the same, he’s had enough of what he sees as a bunch of excuses from CSC. “They’re feeding you a load of crap,” he said, referring to a Daily Herald story where CSC provided a lengthy list of services available to their staff that have witnessed a traumatic event on the job or are diagnosed with PTSD. “At CSC, they take the issue of mental health injuries very seriously,” the Herald quoted a spokesperson as saying in a written statement. 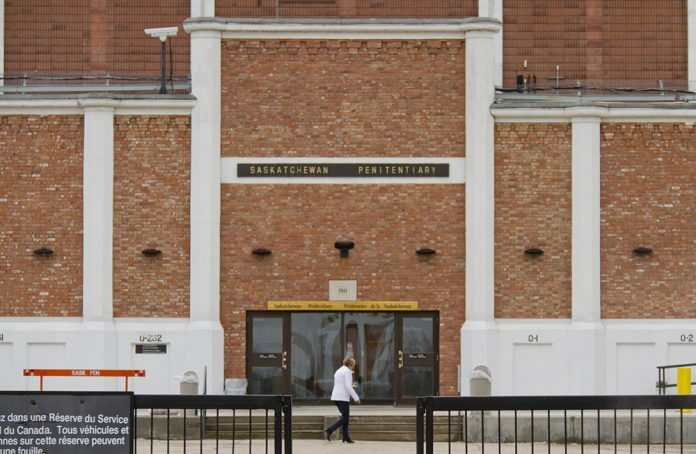 “We recognize the challenges associated with working in a correctional environment and we are committed to providing a workplace that is conducive to the health and safety of all of its employees, including their mental health,” CSC said in a follow-up email. But that’s not how Reynolds sees it. “It’s basically to check the boxes,” he said. Reynolds worked at Boden Institution and was a correctional officer for 29 years. He had flashbacks and dissociative spells. To this day, he’s still looking for CSC to provide the support to its workers he was promised. “I’ve gone through the gamut. If you don’t have peer support, you’re at risk of suicide,” he said. “The day I crashed, I realized I was a mess, I called the (employee assistance program). I did see a counsellor, and the peer support group was great at setting up the appointment, but as far as that goes, the minute they see you have a mental issue, nobody wants to deal with you. You’re just abandoned. One day all the boxes open up at the same time and there’s not a damn thing you can do to close them. Reynolds is far from the only CSC staff member who feels this way. “Everything CSC said made me sick and angry as I read on,” a second officer, from the east coast, wrote in an email. An OSI is any persistent psychological difficulty resulting from operational duties performed as part of a worker’s job. It’s not that support doesn’t exist. CSC and the Worker’s Compensation Board (WCB) have programs in place to help people diagnosed with a mental health injury on the job. According to those who have dealt with those programs, though, they’re ineffective and often result in people at the lowest point in their lives having to fight just to get the help they need. While progress has been made, especially in recent months, many corrections officers, corrections staff and other first responders feel abandoned by the systems that are supposed be to providing them with support. Taylor* (name changed to protect anonymity) works at Saskatchewan Penitentiary as a staff member, not a correctional officer. Staff members review gruesome information contained in files, work with offenders in the kitchen and deliver programs with high-risk groups. “There are many more … that are exposed to trauma daily,” Taylor said. For Taylor, exposure to multiple files and incidents was emotionally scarring. A doctor provided a diagnosis of Post Traumatic Stress Disorder. But now, over a year after the diagnosis, Taylor has allegedly not received appropriate help. “I have used my sick leave and holiday time for mental health days,” Taylor said. Taylor’s claim was denied by WCB and the appeal won’t be heard until February. The employee assistance program (EAP) was good for seven counseling sessions, but wasn’t enough. WCB sent Taylor for a full mental health assessment and local doctors confirmed the mental injury was related to work. The penitentiary has requested medical clearance to allow Taylor to return to work, but without being able to access care, Taylor’s options are running out. “Being ill and having to deal with WCB, disability insurance and no support, I was left to dry. The new mental health professionals I have finally obtained locally have diagnosed the same and identified that it was work related. It’s very hard to deal with when you have no ability to fight,” Taylor said. James Bloomfield frequently hears stories like Taylor’s. Bloomfield is the regional president of the Union of Canadian Correctional Officers and works as an officer himself. The union, he said, has been working closely with CSC to improve access to prevention and care so that fewer officers are forced into the situation where they can’t work and can’t access help. Recent changes include the introduction of the Road to Mental Readiness program and a revamp of the way Critical Incident Stress Management (CISM) is handled. “Over the years, that initial (CISM) contact was done poorly,” Bloomfield said. CISM is used to debrief staff after a serious event, such as a riot or a bad fight and follow-up with staff for potential future care. 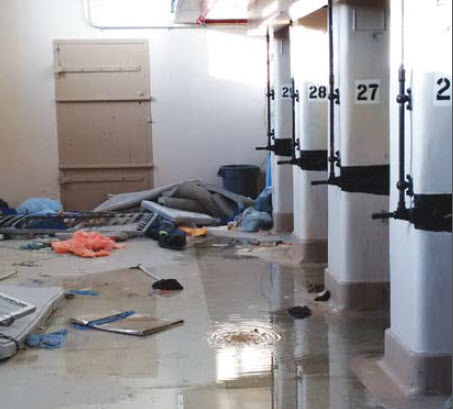 This photo from the Correctional Investigator’s report shows the aftermath of last year’s deadly riot at the Saskatchewan Penitentiary. Where issues arise, Bloomfield said, is with the EAP. “After a riot, as we had at Sask. Pen., I had people placed on a wait list to go talk to a mental health professional because (the provider didn’t have) nearly enough counsellors to deal with anything like that,” Bloomfield said. The result, Bloomfield says, is a feeling of abandonment. Eventually, after the riot, additional resources were brought in. Since then, Bloomfield said, CSC has put out a bid process to improve its employee assistance program. It’s also dedicating millions to studying the prevalence of OSI in public safety employees such as corrections staff, and is implementing online therapy to help employees in need. The problems with the EAP, Bloomfield says, don’t stop there. This is the same system we use when it’s just a build-up over the course of years. You see so much in this profession that it really does build-up. At some point, it’s just the last straw,” he said, describing corrections officers as the first responders, the fire, police and EMS, inside the prison walls. 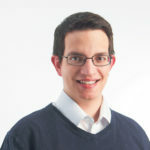 Good data is hard to come by, but according to one study conducted by Dr. Nick Carlton for the Canadian Institute for Public Safety Research an Treatment, over half of corrections staff and RCMP officers surveyed showed positive indicators for at least one recognized mental health issue. Those two professions also had the highest rates of PTSD amongst all those surveyed, and about one-quarter showed positive indicators for three or more mental health issues. Under the current EAP, corrections staff can get a handful of sessions, people who have dealt with it say they get four to six, mauybe seven. CSC says they can get one to eight per issue per fiscal year. “If you’re looking at someone who has 20 years of working in a prison system, if you’re looking for some counselling to help someone in their day-to-day, six sessions is not even scratching the surface,” Bloomfield said. “You need to have that ability to go in every month for, maybe years. Maybe you have to do that for the rest of your career to be able to work. Correctional officers aren’t alone in their fight. Jeff Reeder is President of the Prince Albert Firefighters Association. He also co-chairs the Saskatchewan First Responders Mental Health Committee. He’s also dealt with EAPs that don’t go far enough. “When you let things go to having a diagnosable injury, or post-traumatic stress, it can’t be fixed in six sessions,” he said. When someone is dealing with a workplace-caused mental health injury, one place they can turn is to the WCB. In 2015 new legislation was brought in to help make it easier for people suffering from mental health injuries to submit a claim. “It means giving the benefit of the doubt to the worker when a claim for compensation has been made … it is presumed that a worker has sustained the injury as a result of their work unless there is evidence to the contrary,” the WCB Saskatchewan website reads. According to Bloomfield and Reeder, the actual experience of dealing with WCB can differ from person to person. “I’ve heard a lot of inconsistencies with claims,” Reeder said. Bloomfield hears similar concerns from his members. Even if your claim is approved, you still might not be in the clear. A local, now-retired police officer has been battling with WCB for almost 30 years. Seeking help in a time before there was as much public awareness about the prevalence of PTSD in first responders, he battled his employers and worker’s compensation for years before finally being approved. Still, to this day, if his doctor recommends something like a change in medication, he’s almost immediately denied. He has appealed, fought back, and won, on more than one occasion. It’s that kind of constant fighting Bloomfield and Reeder are trying to stop. It’s a journey Reeder himself has experienced with a different government agency. “It’s exhausting having to fight for everything because you can’t really do any healing when you’re in that fight mode. You have to be able to accept things and move on and focus on healing, as opposed to focusing on the fighting,” he said. Bloomfield says that for corrections, in addition to battling WCB, staff often face a scenario where CSC puts in a counter claim to argue the injuries were not caused on the job. “For some unknown reason, our employer tends to put in appeals to some of this stuff as well. It blows our minds,” he said. CSC did not respond to questions about appealing WCB claims. Bloomfield would like to see it come down to the mental health professionals, not the employer. “Once the mental health professionals and the doctors are involved, that should be the end of it,” he continued. When it goes smoothly, it goes really smoothly, Bloomfield said. He also praised the WCB staff who are very helpful when they take calls from his union members. WCB Saskatchewan vice president operations Mick Williams acknowledges the agency could do better, but he doesn’t believe it’s a lack of training that’s causing the issues. “It would surprise me if there was much variability from one adjudicator to the other,” he said. For example, he said, a claim for cumulative trauma is much harder to assess than one for a single, traumatic incident. Williams said WCB is aware it still has shortcomings, and is working to improve. WCB found that while people waiting for approval, they weren’t able to access help. Williams said WCB is also moving to be less disruptive of an existing relationship with a care provider. “We wouldn’t intervene … unless it wasn’t working,” he said. Reeder is also doing what he can to help people navigate the supports that are available. The committee includes representatives from corrections, police, fire, EMS, health care, WCB, psychologists and a pair of MLAs. “We’re trying to change the framework of how you make a claim, how claims are supported and identifying resources at a prevention stage as well as after you have a formal diagnosis of an OSI or post-traumatic stress,” Reeder said. While some of that could come by improving the path to treatmentthe committee is also focused on prevention. Kevin Mooney works with WCB in injury prevention and is working with the first responders to see what WCB can do to help. After sitting down with the group, Mooney reached out to WorkSafe B.C., which has created a mental health website for first responders. The committee met for the first time in late November and set out some goals and objectives. The first goal was the replicate what was done in BC. Mooney said the committee members are also starting to voice concerns about navigating the WCB system. That support includes outside partners. According to Mooney, WCB is looking at providing support to OSI-CAN, which runs first responder peer support groups across the province, including in Prince Albert. It’s groups like that where first responders, including corrections officers, can find peers who understand and can try to help. 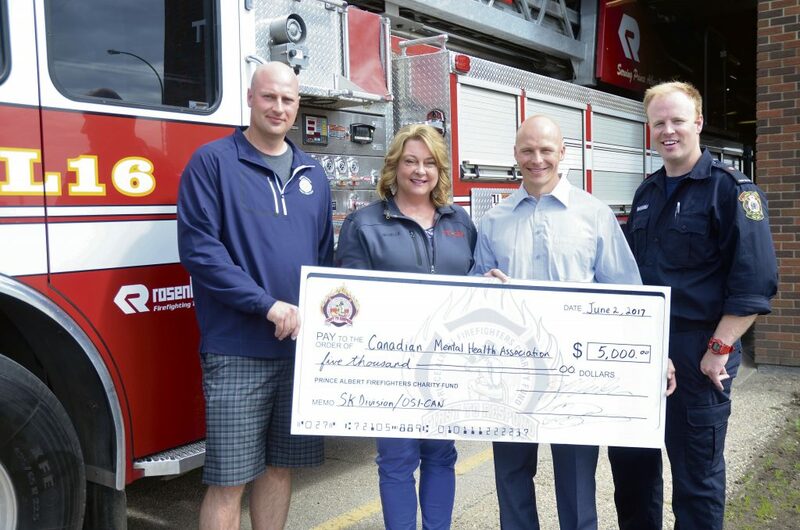 Firefighters Chris Bourdon, Jeff Reeder and Adam Makosiej present MIchelle McKeaveney of the OSI-CAN support initiative a cheque for $5,000 (Peter Lozinski/Daily Herald). Peer support groups have helped many with stress injuries acquired on the job, including Reynolds, Reeder and the retired police officer fighting WCB. “Your brain can rewire and heal. It takes time and effort, but it is possible,” Reeder said. But to heal, first responders need to be able to get the help they need in a timely manner. “When it comes to something like this, the last thing anybody needs is to argue and fight with their employer over definitions with WCB,” Bloomfield said. “We’re hurt. We need help. And we need it to be help that is going to be sustained and work with us to get back into the workplace. We need to be properly treated. We need the appropriate amount of counselling. 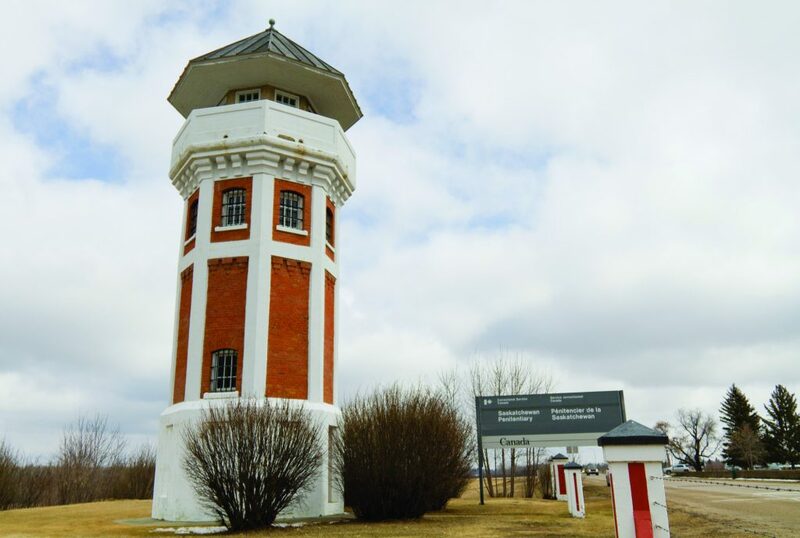 CSC wants to reaffirm that we recognize the challenges associated with working in a correctional environment and we are committed to providing a workplace that is conducive to the health and safety of all of its employees, including their mental health. CSC has a network of 603 Employee Assistance Program (EAP) referral agents and 690 Critical Incident Stress Management (CISM) peers across the country, who can provide a listening ear, referrals to internal and external resources, as well as support during/after critical incidents. In addition to the information provided previously on CISM, the Employee Assistance Services (EAS), a counselling service provider managed by Health Canada, is accessible on a 24 hour basis to all employees as well as their families. Its important to note that the EAS crisis and referral centre for support and assistance, assures the highest standards of confidentiality. When employees call, the crisis and referral centre counsellor evaluates if the need for support is urgent or not (employee in crisis/distress/suicidal). If not, the employees are paired with a mental health professional who will provide from one to eight sessions per issue, per fiscal year. Employees may call for support if they are dealing with issues present in their personal and/or professional life, affecting any dimensions of their wellbeing. The Public Service Health Care Plan provides coverage for a wide variety of health-related products and services. However, as with any health care benefits plan, certain restrictions apply. For services rendered through certified practitioners, such as psychologists, the benefits plan will cover 80% of those expenses. In addition, employees can also have access to psychological services through provincial health care services and Workers’ Compensation Boards (WCB). If the need for psychological care stems from a workplace injury, CSC employees have access to those services after submitting a workplace accident claim to a workers’ compensation board. Once the claim is allowed, the WCB will assess the need and provide the required care, at no cost to the employee. It is to be noted that those costs are subsequently paid by CSC dollar for dollar. A premium is also paid to the WCB for administering the claim. WCB coverage is accessible to all CSC employees. Lastly, a series of articles on PTSD and other mental health injuries are available on Let’s Talk Express (CSC’s e-magazine). Daily Herald follow -up question (response received on Jan. 21): A representative from the correctional officers union said a frustration they have is CSC counterclaiming against guards on WCB cases as to whether or not mental health injuries were acquired at work. Why would CSC be arguing against its employees when a WCB claim is put forward? Regarding your question, CSC employees have access to psychological services through provincial health care services and Workers’ Compensation Boards (WCB). If the need for psychological care stems from a workplace injury, employees have access to those services after submitting a workplace accident claim to a Workers’ Compensation Board. All PTSD claims submitted to WCB’s are reviewed on a case-by-case basis. Compensation benefits are provided when it is confirmed through medical diagnosis and WCB’s follow-up information that the PTSD diagnosis is work-related. Once a claim is allowed, the WCB will assess the need and provide the required care, at no cost to the employee. It is to be noted that those costs are subsequently paid by CSC dollar for dollar. A premium is also paid to the WCB for administering the claim. WCB coverage is accessible to all CSC employees. CSC’s commitment and dedication to supporting employees who submit a workplace related injury claim, during their leave, treatment and return to work, has not changed. However, there may be certain circumstances where it is necessary to provide additional information relative to a claim. Such circumstances may be due to intertwining Labour Relations issues or differing evidence regarding incident information for example. In such cases, CSC refrains from making any comments or judgments on diagnosis or on specific medical information, rather, it provides verified facts and information relative to the incident(s) in question. As we previously mentioned before, Public Safety Canada (PS) continues to work closely with its partners to develop a coordinated action plan on post-traumatic stress injuries in support of public safety officers. We expect to launch the Action Plan on Post-Traumatic Stress Injuries in Spring 2019.